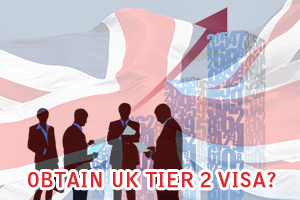 Home » UK Immigration Visa » What are the requirements to obtain UK Tier 2 Visa? This entry was posted in UK Immigration Visa and tagged uk tier 2 visa UK tier 2 visa process uk tier 2 visa sponsors on July 25, 2014 by Blog Author. Are you interested to Work in UK? Looking for best work permit? Then, you can choose UK Tier 2 Visa. This visa is the best option for skilled workers who wish to migrate to UK. UK is offering excellent employment opportunities for overseas individuals, which entices them to work in UK. UK work permits are categorized into 4 types as UK Tier 2 visa – General for skilled workers, Intra-Company Transfer, Ministers of Religion and Sports Persons. Each category has its own specifications and requirements. UK tier 2 visa permits overseas individuals to reside and work in UK. However, individuals to obtain UK Tier 2 Visa must fulfill the following requirements and should also pass the point based test. Should have a qualification equivalent to UK degree. Should possess Higher National Diploma (HND) qualification i.e. relevant to the employment. An HND-level qualification i.e. not relevant to the job offer plus one year full-time work experience pertinent to the employment, and which is at N/SVQ Level 3 or above. At least three years experience in work using the talents obtained by working in the same job role for which work permit is required. The work experience should be gained at N/SVQ Level 3 or above. Initially to apply for a UK tier 2 visa applicant must be a skilled employee and should be from outside European Economic Area. Applicants need to have a valid job offer from the employer in prior to visa application process. Applicants must hold a Certificate of Sponsorship from a UK employer who has a legal Tier 2 sponsorship license. Once the applicants meet the UK tier 2 visa requirements they can apply for a UK visa and should also qualify in the point based test to continue for further UK tier 2 visa process. Individuals to obtain the UK tier 2 visa work permit should secure at least 70 points in the points based test. Based on the proficiency in English language, educational qualification, Certification of Sponsorship, financial capability and earnings points are allotted. Please fill out Our Enquiry form and also follow us on @ MoreVisas Facebook, LinkedIn, and Twitter for more UK updates. I wants to immigrate to foreign country with my family as i have done 3 years diploma in electrical engg and having 10yrs of experience,IELTS Score-Overall 5.5 Bands Age31yrs.So please suggest suitable visa regarding this profile.